Accra, Feb. 7, GNA - The United States has urged Togo to respect strictly the constitutional process of Togo, which would lead to elections for a new president following the death of President Gnassingbe Eyadema on Saturday. In a press statement copied to the Ghana News Agency on Monday, Mr Adam Ereli, Deputy Spokesman of the US Department of State, said United States had long encouraged Togo to move towards full participatory democracy and continued to believe that this must be the goal for the Togolese Government and the opposition parties. Mr Ereli extended the condolences of the US to the people of Togo and to the family of President Eyadema during the time of national mourning. 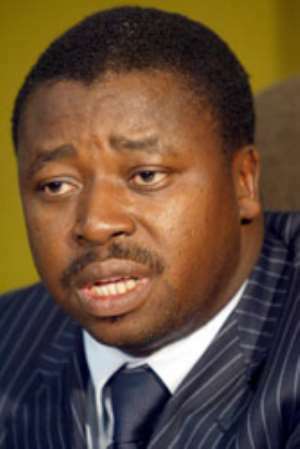 There has been widespread international condemnation of the assumption of power by President Eyadema's son, Faure Gnassingbe (pictured) in contravention of the constitution. Citing alleged concerns of a power vacuum, the military on Saturday installed as leader Gnassingbe instead of the then parliamentary speaker, Fambare Natchaba Ouattara, who was outside the country. African Union has descried it as a coup and a delegation of the Economic Community of West African States (ECOWAS) is in the Togolese capital, Lome, to hold talks with the country's leaders. Faure Gnassingbe vowed on Sunday to continue the West African country's democratisation process and work to improve the welfare of the people. "Togo is committed unreservedly to a process of democratisation and opening, and I intend to pursue it to the very end with your agreement," Gnassingbe told lawmakers after they installed him as the replacement of his father Gnassingbe Eyadema, who died on Saturday after ruling the country of 4.7 million people for nearly four decades. "Our only worry should be the well-being of the worthy population of our country and I need the support of everyone to promote a better Togo for all," he said. Earlier, the parliament dominated by the ruling Rally of the Togolese People party (RPT) elected Gnassingbe the new head of the National Assembly, putting him in line under the constitution to succeed his father and removed the constitutional provision requiring new elections within two months. Gnassingbe can now serve out his father's term, which lasts until 2008. "Rest assured ... I intend to exercise power in the tradition of my illustrious predecessor," said Gnassingbe.